half of the Gateway Centre. of seven buildings including main street retail facing Na’a Drive with residential above. needed grocery shopping options to Trinity Hills and the surrounding communities. with store openings anticipated in the second and third quarters of 2019. We’re committed to providing important information to our neighbours. Check this page for important updates as construction progresses. 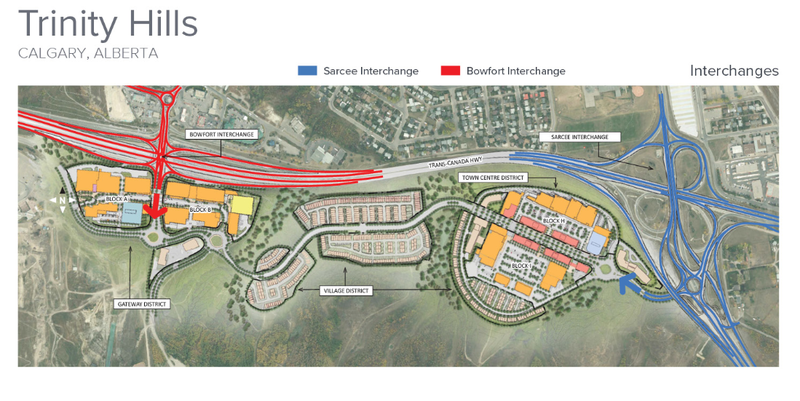 The TransCanada Highway (TCH) – Sarcee Trail Interchange project is open and operational. Commuters may notice some finishing touches being tended to as we complete clean up and landscaping this spring. The pathway underpass and public access road into the new development are the only small projects left to finish. Trinity plans to have access to the Medicine Hill community open to the public by late 2018. For updates on construction progress and traffic interruptions, sign up for the Trinity Hills newsletter.